This is what all star football quarterback, Peyton Manning, said after he won Super Bowl 50 this past Sunday. Some congratulated him for sharing his “faith” in national television. However, what is the man upstairs supposed to mean? Or better yet, whom is he referencing? I have been personally annoyed by this statement for many years. When someone calls God the man upstairs, it is a telling sign that they don’t know Him. Think about it this way. If my mother lived upstairs in my two-floor apartment building, and I referred to her as the woman upstairs, what does that infer about the relationship that we have? From a linguistic standpoint, it could just be a cultural phrase, and it’s semantic intention is purely arbitrary. However, throughout history, Christianity is defined by Christ dying for sinners, then regenerating and adopting them as His children. From there we continually cry out, “Abba, Father” (Romans 5:15). We are made sons and daughters by His will (John 1:13), and are no longer called children of wrath (Ephesians 2:3-6). At what point in Scripture or history among God’s people do we find such distancing language to describe God? 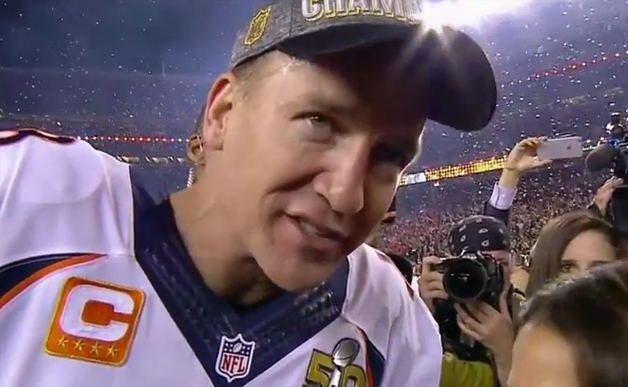 I am not too upset over Peyton’s choice of words. In part, I’m glad he said it. Because maybe now we can discuss how a true believer ought to address God among the heathen. If He is our God, why choose language that infers a gap in the relationship? This kind of speech is typically used by those that do not have a meaningful relationship. By that I mean, usually, none at all. If I called my wife “the woman upstairs,” there would be some indication that the relationship is straining, unless there’s an obvious sign I was joking. But many aren’t joking when they use this trite slogan. To some, this is most recognition they will give God, and that is enough for them. To others, this is a hat tip of humble reverence. Whether it is done ignorantly, or with purpose, those that say that they know Him should not (dare I say will not) bow to this kind of speech. If eternal life, as defined by Christ, is knowing God, and His son whom He sent (John 17:3), I can’t see how a truly regenerated believer would allow such catchphrases to dwell in their vocabulary. On one hand, I am saying that Christians need to rethink such pithy slogans to describe their God. On the other hand, I believe that this phrase is a penalty flag, that could be a sign that the person does not know Jesus. In other words, I believe anyone who uses “the man upstairs” has never actually met the Man (Christ Jesus; 1 Timothy 2:5). But who am I kidding? Could someone be a true believer and mistakenly utilize such ignorance? I have to consent to the possibility. But more often than not, specifically in my experience, whenever I hear “the man upstairs” come out of someone’s mouth, what follows after, whether in word or deed, as just as atrocious. This entry was posted in Random Selections, Theology and tagged beer, Broncos, God, man upstairs, Peyton Manning, Prayer, reverence, Super Bowl 50. Bookmark the permalink. ← Are You Like Judas or Peter? I stand with ye, George. It bothers me when Christians are sloppy in describing or speaking about the Lord God. It’s not as if we’ve been given cart blanch to make up a god of our choosing. Well he certainly chose a specific brand of beer to communicate! But then what else shall we expect from a western churchianity that on the liberal side preaches a best life now, and on the conservative side preaches a best life later! Think bout it…Each side is man sided humanism. How about we serve Him because of Who He is! May the Lamb that was slain be given by men the pre-eminence He deserves and already has! Thanks brother for the post.